Before I jump into the announcement, I better come clean about Android before I get slaughtered. Yes, it’s on its way. We had hoped to release them at the same time, but getting the app to work exactly on all the different screens is posing a design challenge. We hope to have those fixed in the next few weeks. So, Android folks, please know that the Android version is on its way! UPDATE 10/21: The Android app is now available on Google Play and Amazon Appstore. Please report any bugs or submit any suggestions through BitBucket. In all other respects, I am very pleased to announce version 2 of the Hammock Hang Calculator app, currently available for iOS devices (iPhone, iPod Touch, iPad). In this new version, I’ve cleaned up and tightened the artwork and other visual components. Both the iOS version and Android versions have the same functionality, artwork, and visual design. 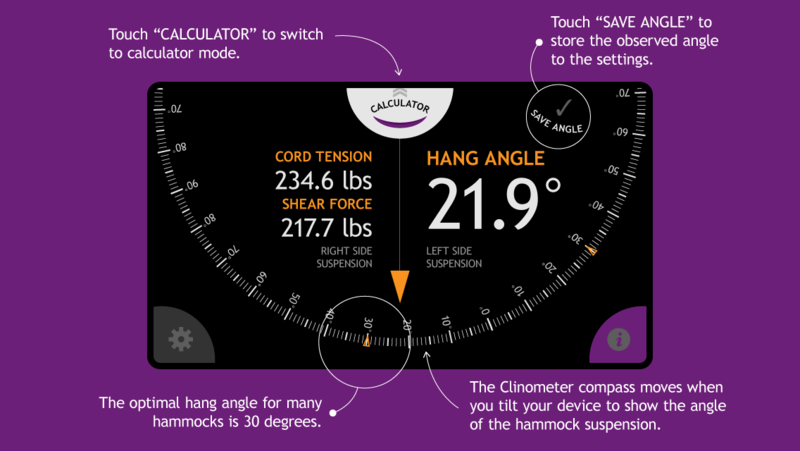 The new Hammock Hang Calculator has a built-in clinometer so you can check your hang angle on the fly and save it to your settings. The other major update is the inclusion of the clinometer. The clinometer provides an interactive “level” of sorts that uses the phone’s accelerometer to give you the precise angle on your hammock’s suspension. This angle can also be saved directly into the calculator settings to make it easier to get a precise reading. 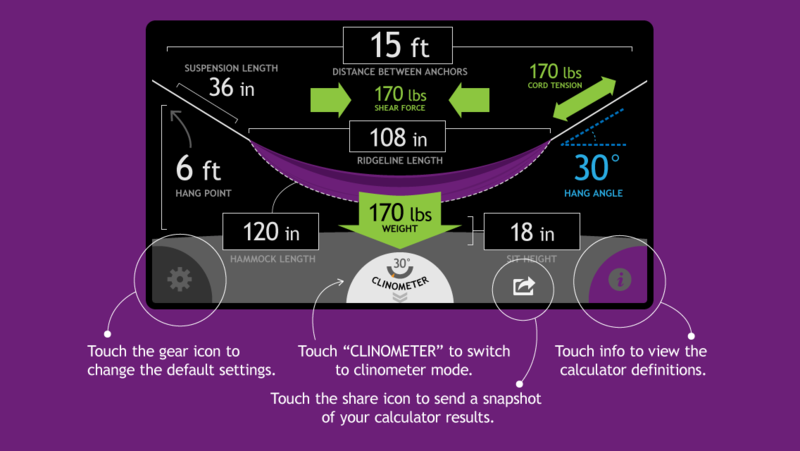 The clinometer refreshes the force calculations live so you can see how the angle affects the hang in real time. Matching up the clinometer with the calculator is a natural fit, allowing you make calculations and then check them in real life. New sharing features allow you to save a screenshot of your calculator and post it on social media, email, and other services. If you have other requests that you would like to see in a future update, please add a comment to this post! Thank you all for your support of this handy hammock utility. Looks great, congrats on another awesome release Derek! I love the new app! The graphics are sharp and clinometer is helpful. I have a feature request for the next version. Could you add the ability to set your head or feet higher into the calculator? Thanks Dave! I’ve submitted the idea to the developer. Thanks! I just bought the app today. Any word on the ability to set head/foot higher? Thanks. So, it works downunder… WooHoo! Upside down and all? Bwahahahaha! Answer: Who cares! It’s all good fun! Request for new feature: Is it possible to add a distance measuring feature using the phones camera? Something like EasyMeasure? This would be a great tool. Find your two trees. Stand at tree 1, point iphone camera lens towards tree two and have distance to go into the calculator. ULTIMATE hanging tool! just a thought. Cool idea! I’ll look into it and talk with the developer. This is an excellent tool. So far I used the “Angle Meter” App on iOS. So what I’m missing with the Clinometer is the “see-through” option using the camera. That would be a great upgrade. We debated about having a “see-through” option on the clinometer; however, with all the other data we wanted to show, it became too distracting and ultimately difficult to see the numbers, etc. It is a type of augmented reality that has a “coolness” factor, but ultimately didn’t improve the performance or usefulness at all. Like any leveling device, it is best used when you put the phone/device close to the suspension. If you are too far away, your results are less accurate. And being close and touching the suspension, the see-through option is less effective. I suppose if there is enough demand. No plans as of now. It seems like the weight calculations in the clinometer aren’t quite right.. When in english mode the cord tension is 1/2 my weight when holding the phone at 90 degrees (which is correct). But in metrics mode the cord tension is only 2/9 of my weight when holding the phone at 90 degrees. Hey, Derek, I know this is way old, but the app doesn’t seem to be keeping up with today’s phones. Particularly the screen resolution. Can you say if there are fixes coming out any time soon? I want to give you my money but I have a Note 8. Thanks! I appreciate your support. The new app was released a few months ago with support to more devices. I’m not 100% sure on the Note 8, but most Android devices are now working. The clinometer has been slated for the next release so it isn’t in this current version but will be soon. After the update i have no clinometer. 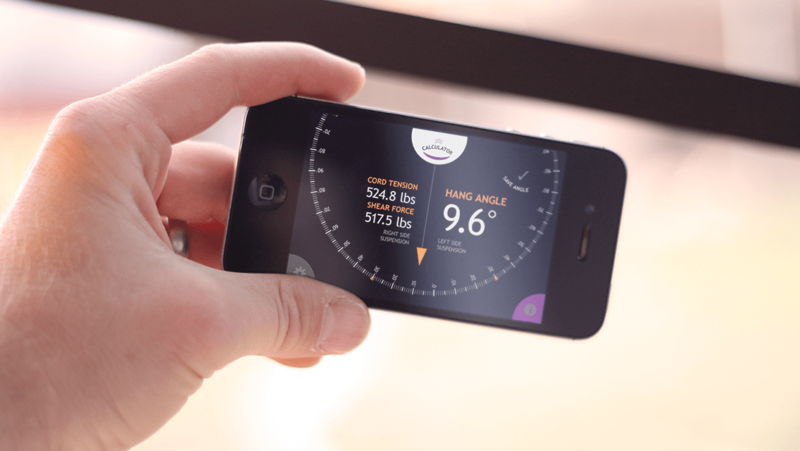 The clinometer is coming in an updated release. Our first goal was to get the app compliant with the modern mobile devices, primarily android. None of the links for android seem to be working, I would love to have the app, even if it doesn’t work perfectly on the newer versions of android. Any ideas? Thanks Jeremy. I had the developer take down the Android version recently due to version issues. Some variations of Android weren’t working and I felt the best option was to pull it down until we could find a fix.